Anyways, the little prince eventually gets to Earth and talks about his planet and his prized possession (a flower he thought was unique in all the universe but is actually a common rose!) to a fox who gives him some advice as a parting gift... "What is essential is invisible to the eye." "It is the time you have wasted for your rose that makes your rose so important." "You become responsible, forever, for what you have tamed." These words, Saint-Exupery is saying through the words of the fox, lead us to real matters of consequence. It is not the busyness of our lives or the selfish dreams we pursue that really matter. These things are really insubstantial compared with things like love and devotion. Well, I spent most of my day today starting to refinish the floors upstairs in my house. I've got some cool before, during, and after shots to post up, but I left the camera upstairs and don't have all the strength necessary to go get it and find the firewire cable to put the images on this computer. Instead, I'm just unwinding in my recliner while studying the children's Sunday school lesson for tomorrow. Which brings me to the point of this post. A bed time snack is a good thing to have while reclining in the living room just before bed. I decided to have a pudding cup. While banana and butterscotch are my favorites, this one was chocolate. It was good enough, but it reminded me of the fundamental flaw of the pudding cup. Nobody just wants a cup of pudding. I don't think I'm alone when I say I'd much prefer a pudding bowl. I searched for a module similar to what I'm looking for and only found the Favorites module which is a far cry from what I need. The User Favorites module will actually allow users on a site to add content to a favorites list. It makes sense to give users the option of creating multiple favorites lists and will be fairly trivial to implement. Any of these lists may be set to be private or public lists. Users on large community or directory websites will be able to tag and track content through the site itself using their in site favorites list as well as provide feedback to the community regarding the value of content on the site. Users will be able to browse the public favorites lists kept by other users as well as see who else on the site has favorited a specific piece of content. Favorites lists will be broken down by content type and sorted alphabetically, with users having the option to star a specific piece of content to make it sticky at the top of a list. Integration with Views means site developers will easily be able to create and sort lists of nodes ranked by how many times they've been favorited and/or starred. (Perhaps for the purposes of ranking, favorited content should count as 1 point while starred content should count as 3. Or rather... I can simply make that an administrative decision.) Integration with Userpoints means you can give users some love for providing feedback to other members of the community. I'm happy to consider any further integrations with this module and am quite excited at the prospect of it being a first of its kind. However, if someone else knows of a module that may do something similar, please post it up here so I don't needlessly duplicate someone else's effort. EDIT: A Tuesday morning, it's no longer past midnight, idea struck me on the way to work... I forgot to mention the idea of favoriting other users. This would allow you to track content posted by others and allow a ranking system for users similar to the one I mentioned above for content. It could be fun to use these statistics to display user relationships, user favorites compatibility (how much of your favorites match? ), and other things like that. Maybe I can get Balazs to draw me up a user relationship graphic with his Drawing API. EDIT 2: Several folks have been posting up some very helpful pointers to modules that implement different parts of this idea. Let's just say... I'm never going to start a new module without doing a post like this first. This has been an invaluable learning experience, and hopefully I'll find some time to review the various modules and build on someone else's foundation. Why use Drupal for e-commerce? I recently posted a page to Ubercart.org titled, Why use Drupal for e-commerce?. In it I made some observations about Drupal and how it is the perfect platform on which to base an e-commerce site. All the things we wish other e-commerce specific systems would do (or that we have to hack to get done) Drupal does out of the box. Feel free to give it a read and offer up any feedback here. It's got great search engine optimization (including easy SEF URLs with the path and pathauto modules). It's a very powerful content management system, which is a must for future e-commerce sites and a great benefit to companies that market products supported by a niche market or particular community. There are many folks out there (like me!) 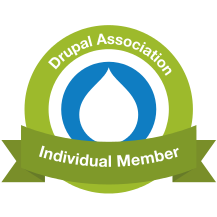 who are available to help and to work for you as you start to setup your Drupal + Ubercart site. Having the whole directory of contributed modules and themes is great. Anyways, enough shameless promotion of Drupal and Ubercart for now. I'm just about to roll out the Alpha 7d release and need to do one final test on an update from a previous version to make sure I don't go breaking anyone's site with the release!